Raised Garden Bed Corners for Large Gardens. Extra heavy duty steel plate brackets clamp the wood with big bolts. These have the advantage of not giving rise to "nail-sickness", a term for decay accelerated and concentrated around metal fasteners. Heavy Duty Bolted Steel Plate Brackets were originally designed for urban community gardens. They are commercial municipal grade to make raised beds last as long as possible. The Black Steel Plates and contrasting Galvanized Bolt Heads result is a very stunning industrial urban look. This contrasts perfectly with rich green foliage and flowers or vegetables. Hot dip galvanized carriage bolts, washers and nuts eliminate rust problems even in long term contact with wet soil No need to depend on the holding power of nails or screws in wet wood. These 1/8" thick steel plates are through bolted and solidly clamp the joints together. Forged inner and outer side brackets clamp the 2 x 6 wood together and have provisions for anchoring so you won't have a problem with the sides bowing. This is a very easy DIY project. I have included a steel plate with holes as a template. Put it on the end of the plank and you can mark or drill the holes. Not included are 2 x 6 planks and a 1/2" diameter drill. An instruction sheet is also included. 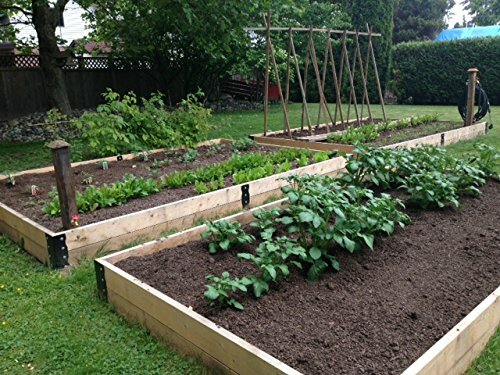 Raising your garden bed is important to ensure a successful organic garden. -Reduce problems with border encroaching weeds. -Eliminate the need to for edging -Fewer pests. -Better aeration and drainage for your soil. If you have any questions about this product by Ideal Garden Products, contact us by completing and submitting the form below. If you are looking for a specif part number, please include it with your message.